By nature, damselfish are hard working algae farmers which rely on algae for nourishment. It makes sense that they are very territorial and very protective of their algae patches, especially since not just any algae will suffice. Their strength and ability to work in social groups is distinctive and really quite amazing. In this video I came across a patch of damselfish algae and put a sea urchin in the middle of it. The intruder was attacked by the little damsel fish who tried valiantly to remove it. When one alone couldn't succeed in ousting the invader, other damsels came to help. Strong but mighty! We have more than one type of damsel fish in Galapagos: Yellow-tailed, sergeant major and giant. These fish are not endemic (meaning unique and exclusive) to Galapagos. But according to scientists there used to be an endemic Galapagos damselfish (Azurina eupalma), now (sadly) extinct. The last time an endemic damselfish is recorded was in 1982, before Galapagos was hit by a very strong El Niño event. According to scientists, the Galapagos Damselfish is the first known marine fish to have gone extinct while someone was observing and also the first known to disappear because of climate change. I've never personally observed the Galapagos Damselfish that I can recall. These images from NASA graphically demonstrate the change in water temperature and its dramatic effect on marine plankton and small fish such as sardines - and presumably the Galpagos Damsel, during an El Niño period. The water gets so hot that little fish are threatened and lose their place in the food chain, resulting in starvation of many larger animals and fish as well. 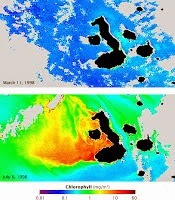 For more information on this phenomenon see my earlier post on Galapagos Ocean Currents. In 1893, specimens of the Galapagos Damselfish were collected and preserved. Examples still exist at Stanford University. Reports say this old time damsel looked like a sardine. Admittedly, the little damselfish is unexciting, it's not like watching what scientists tell us is the growing reduction and possible extinction of the Galapagos blue footed boobie, which I wrote about in my last post. But, that does not mean that the extinction event is unimportant. For one thing, our climate continues to change. We are threatened with another El Niño very soon, maybe by the end of this year. What else will Galapagos lose - or, for that matter, what will happen within other ecosystems on our planet? We have to be aware and have to take affirmative steps to protect all of the species. In my recent Blue Footed Boobie post I told you that there is a major reduction in the number of sardines and, as a result, not enough food for the boobies. Other birds and fish dependent on sardines are equally threatened. What else may have been lost, then, when the Galapagos Damsel became extinct after 9 million years of existence? We don't know the specifics. But, we do know it's part of the inexorable change going on in our environment. It was interesting to watch your video. I like to find new information about marina area. I like to read different articles like this one http://collegetonightinc.com/ about new species and sea exploration.